Palin adroitly re-wrote the history of the past three months of elections, giving the Tea Party movement credit for Scott Brown’s election in Massachusetts and calling the White House “0 for 3″ in recent elections–leaving out the New York special election where her candidate, the Conservative Party’s Doug Hoffman, lost in a last-minute upset. “You know,” said Palin of Brown, “he was just a guy with a truck, and a passion to serve his country,” said Palin. Brown, however, was a state senator and state representative whose campaign staffers cut their teeth with Mitt Romney. So, one of the US congress’s top priorities should be … asking for divine intervention from God? “I can think of two words right now that scare liberals: President Palin,” the moderator ended the evening by saying. A brief chant of “Run, Sarah, run,” broke out, although not one shared by the whole room. Proving, perhaps, that you don’t have to be a liberal to be worried by Sarah Palin. The GE (GE) unit has removed every episode of the show’s seven-month run from its NBC.com site, as well as Hulu, the site NBC owns with News Corp.’s (NWS) Fox and Disney’s (DIS) ABC. A little odd, given that a couple of days ago, the network was offering every single “Tonight Show” episode O’Brien had taped on NBC.com. But then again, everything about this story has been odd. NBC declined to comment. NBC–at least, I’m assuming it’s NBC–has also been aggressive about taking down Conan episodes from Google’s (GOOG) YouTube. 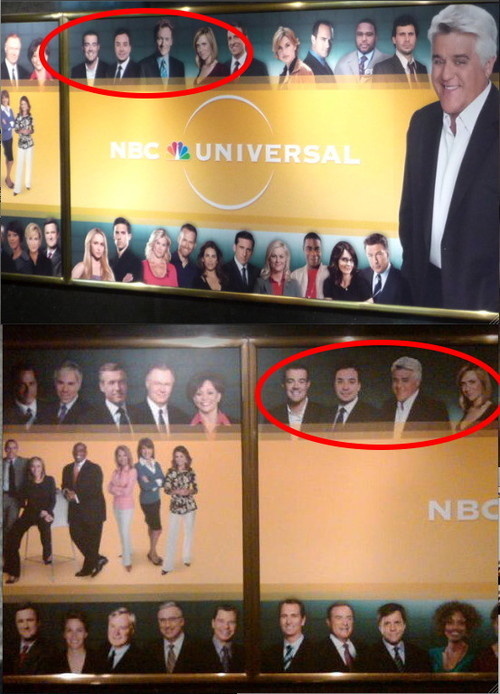 Conan’s picture has also been removed from a mural in the lobby of NBC’s corporate headquarters. The message from NBC is that Jay Leno has always hosted The Tonight Show since Johnny Carson retired, just like Oceana was always at war with Eurasia. Conservatives and libertarians believe that our health care system makes us more free than the rest of the industrialized world. A system which leads to millions being uninsured and placing even those with insurance at risk of bankruptcy if they get sick does not mean we are more free–it means we are backwards. If people insist on keeping their current insurance plans that is one thing, but please don’t also block plans to allow others to voluntarily buy into Medicare or a public option. –GOP Chairman Michael Steele objecting to repeal of Bush tax cuts for the wealthy which would still leave taxes well below the rates under Ronald Reagan. Here’s what Fox has done, through their cyclonic perpetual emotional machine that is 24 hours a day, 7 days a week: They have taken reasonable concerns about this president and this economy and turned it into full-fledged panic attack about the next coming of Chairman Mao. If by “fair cut” O’Reilly means “cut in a manner that left some of Stewart’s best lines, most effective arguments, and most convincing evidence out of the interview and hidden from the broadcast audience,” then he’s absolutely right. STEWART: Here’s the brilliance – here’s the brilliance of Fox News. What you have been able to do, you and Dr. Ailes, have been able to mainstream conservative talk radio. O’REILLY: Why wouldn’t John McCain come on this program during the last campaign? Why did he dodge us and not come on if you – (inaudible), if we’re in business to help the GOP, he wouldn’t come in. STEWART: But you’re not in the business of John McCain. He is not GOP enough for you. You’re in the business to help Sarah Palin.